Lightly battered and fried, then glazed with a warm and light honey sauce and topped with sesame seeds. Vegetarian summer rolls. 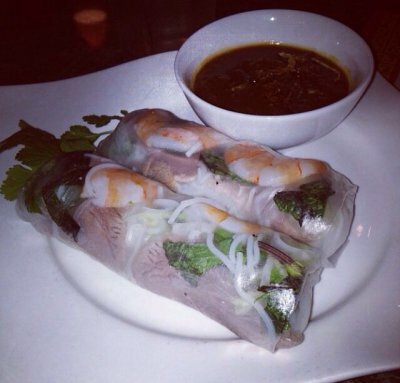 Sautéed vegetables and tofu with vermicelli rice noodles wrapped in steamed rice paper. Chicken tossed in chopped lettuce, mint, cilantro, ginger, onions, garlic, and pineapple, topped with peanuts. Steamed soybeans tossed with garlic. 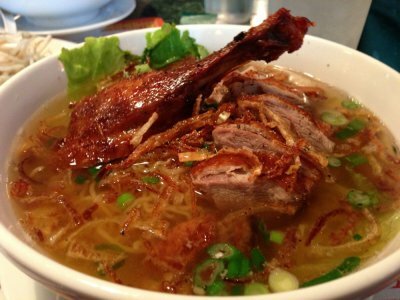 Roast duck slices and drumstick with yellow egg noodles in a savory broth and topped with fried onions. Thin slices of beef, onions, and scallions, with rice noodles in a fragrant, simmered broth and topped with ground black pepper. Thin slices of chicken, cilantro, green and fried onions with rice noodles in an aromatic broth. Beef and pork with thin vermicelli rice noodles in a rich and SPICY lemongrass broth. Shrimp, pork, and chicken, with rice noodles in a delicate broth. Shrimp and pork with yellow egg noodles in a broth dashed with garlic. Shrimp, fish, squid, imitation crab, and scallops with rice noodles in lightly spiced broth. Colorful array of vegetables and silky tofu with rice noodles in a light and flavorful broth. Grilled pork simmered in light sauce, garnished with peanuts and served with vermicelli rice noodles. Breast of chicken in light herb sauce. Served with jasmine rice, cup of soup, and side salad. Chicken chopped and stir-fried in lemongrass with caramelized onions and peanuts. Served with jasmine rice, cup of soup, and side salad. Marinated boneless pork chop barbecued to perfection and topped with peanuts. Served with jasmine rice, cup of soup, side salad, and fish sauce. Juicy grilled shrimp cooked in light, homemade tomato sauce. Served with jasmine rice, cup of soup, and salad. Juicy grilled shrimp and onions cooked in coconut milk. Served with jasmine rice, cup of soup, and side salad. Filet of tilapia grilled and topped with chopped apples and peanuts. Served with jasmine rice, cup of soup, side salad, and fish sauce. Braised tilapia pieces simmered in caramel sauce. Served with jasmine rice, cup of soup, and side salad. Cubed beef sautéed with onions, black pepper, and soy sauce. Served with jasmine rice, cup of soup, and side salad. Rice delicately fried with choice of shrimp, ham, or chicken, topped with fried onions. Served with cup of soup and side salad. Rice delicately fried with shrimp, ham, chicken, and egg, topped with fried onions. Served with cup of soup and side salad. Stir-fried vegetables and tofu. Served with jasmine rice and side salad. Sautéed vegetables and tofu with baby corn and bamboo in special tomato sauce. Served with jasmine rice and side salad.